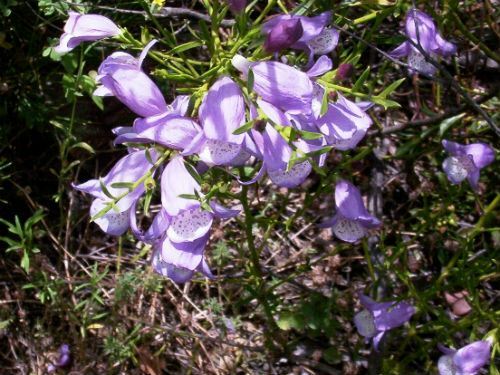 Eremophila ‘Summertime Blue’ is a naturally occurring hybrid whose parents are Eremophila divaricata and Eremophila polyclada. The hybrid originated in northwest Victoria on the floodplains of the Murray River. ‘Summertime Blue’ will reach a height of two metres with a similar spread. The leaves are narrow and light green. Large, tubular flowers are pale lilac tinged with a deeper lilac. Summer is the main flowering period with sporadic flowering at other times. The blooms are rich in nectar and attract honeyeaters. This attractive hybrid prefers to grow in full sun but will tolerate filtered shade. ‘Summertime Blue, once established, will survive and thrive without watering. The specimens, in our cold climate garden, cope well with frosts. Pruning, after the summer flowering extravaganza, is beneficial.